The BlueClaws are nominated for SIX MiLBY Awards this year! Vote BlueClaws in the MiLBY Awards - the BlueClaws are represented in six different categories highlighting the best in the 2018 season. Voting runs through Wednesday, October 24th and the awards will be unveiled beginning October 25th. HOW TO VOTE - Vote online by clicking here. Below, find a rundown of BlueClaws nominations. Top Starting Pitcher - David Parkinson: Parkinson began the season with the BlueClaws and went 8-1 with a 1.51 ERA over 17 starts before going 3-0 with a 1.24 ERA over five games with Clearwater. His combined 1.45 ERA was best among all full-season starting pitchers and the fourth-best since 2005. Parkinson had a stretch of 32 innings without allowing an earned run with Lakewood that was snapped on June 25th. He also threw seven scoreless innings with 11 strikeouts in a Father's Day win over Hickory that, combined with a Kannapolis loss that night, put the BlueClaws in the post-season. Best Team - BlueClaws: The BlueClaws won both halves in the South Atlantic League Northern Division, becoming just the sixth SAL team to accomplish that feat since the league switched playoff formats in 2000. Plus, Lakewood led all of Minor League Baseball with a team ERA of just 2.74 and in shutouts with 23. Their 87 wins were the second most of all 120 full-season MiLB teams this year. Top Relief Pitcher - Zach Warren: Warren saved 15 games for the BlueClaws this year, 14 of which came in the second half when he gave up two earned runs in 26.1 innings with 56 strikeouts against just 87 batters faced. A Vineland, New Jersey native, he was a 14th round pick last year out of the University of Tennessee. Game of the Year - SAL Championship Series, Game One: Down 5-0 in the ninth inning of Game One of the SAL Championship Series, the BlueClaws exploded for five runs to come back and tie the game. After singles by Josh Stephen and Jake Scheiner, the BlueClaws got back-to-back-to-back home runs from Rodolfo Duran, Jhailyn Ortiz, and Nick Maton to tie the game. They would win the game in the 11th on Madison Stokes' RBI single. Best Performance: Spencer Howard's Playoff No-Hitter: In Game Two of the SAL Northern Division Championship Series, BlueClaws RHP Spencer Howard threw just the third nine-inning no-hitter in BlueClaws history (first in the post-season). The right-hander navigated a bases loaded jam in the third inning and then allowed just a hit batsman over the last six innings. He threw 73 of his 103 pitches for strikes and fanned nine in the win. Best Farm System - Phillies: Four of the Phillies affiliates (Lakewood, Lehigh Valley, Clearwater, and the GCL Phillies) made the post-season this year with several breakthrough players across the organization. The organization's .539 winning percentage in the minors was the fifth best among the 30 organizations. 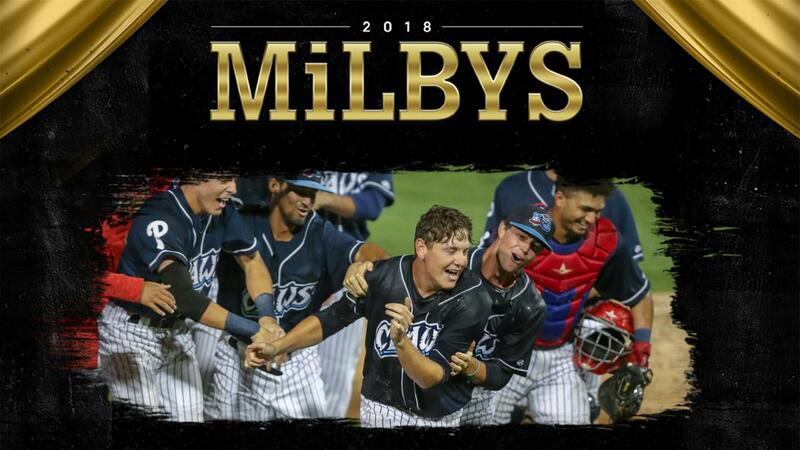 Be sure to vote BlueClaws in this year's MiLBY Awards by clicking here. The BlueClaws join Triple-A Fresno and Double-A New Hampshire as the only teams with nominees in six different MiLBY categories.